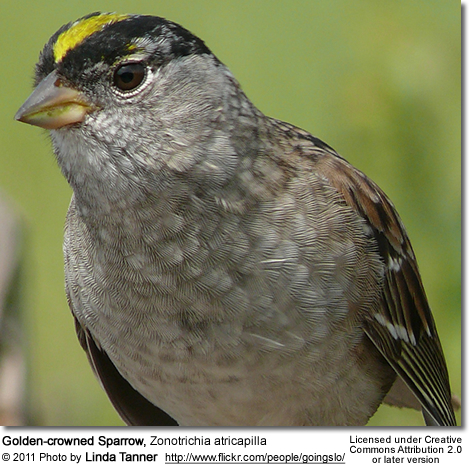 The Golden-crowned Sparrows (Zonotrichia atricapilla) breed across the north part of western Canada and the U.S. state of Alaska. These migratory birds travel in large flocks to and from their breeding territories. In the winter, the Golden-crowned Sparrows migrate to Vancouver Island in Canada and the West Coast of the United States. They are found in California eight months out of the year. One lone male has been photographed in Oklahoma, USA in 2016 and 2017 by Roy Neher who sent us the following message about this sparrow: "My observations suggest last year was new. It was very skittish and spent a lot of time observing the area and watching other birds. This year. the bird is obviously more relaxed and familiar with the area. When it arrived, it went straight to the ground where all the sparrows feed. Very scruffy looking when it arrived a month earlier than last year but it is now in it's spring finery. I believe last year was an accident but, this year was deliberate." This information would suggest that this species is expanding its territory. 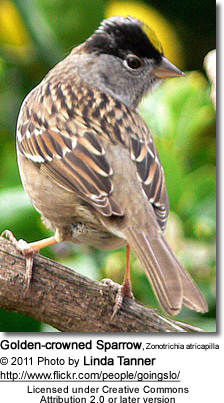 This medium-sized sparrow averages 18 cm in length. 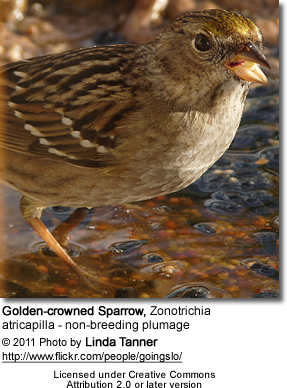 It is slightly larger than the closely related White-crowned Sparrow. In the breeding season, it has a distinct gold patch on its head, flanked by two dark black stripes. 'When not breeding, its plumage is more variable, ranging from a small, dull gold patch and no black, to near-breeding season plumage. It nests in shrubby habitat above the treeline or near the coast and lays 3-5 brown-marked greenish white eggs. At bird feeders, they tend to avoid face-to-face conflict with other birds. The song is a three-note whistle, descending in pitch. It is very distinctive, and often described as "Oh-dear-me". However, birds in the mountains of British Columbia have been reported to have trill on the third note, rather than a clear whistle as in other populations.